St. Paul’s Thrift Shop is open on Thursdays from 10:00 AM until 6:00 PM, and is staffed by friendly, welcoming church volunteers. In the summer of 2011, volunteers gave the entire Thrift Shop a complete makeover– making it a bright, beautiful, all-bargain boutique. The Thrift Shop accepts men’s, ladies’, and children’s clothing and footwear in good condition and offers them for sale at affordable prices. Parishioners and friends enjoy modeling. The Thrift Shop also works with local service organizations to provide business-wear to people returning to work, and has a long history of generous assistance to families who have suffered a flood, house fire, or other disaster. In the spring, the Thrift Shop organizes a Fashion Show; parishioners model a variety of quality apparel which are offered for sale that day. Luncheon also is available. The Fashion Show is held annually in the spring, sponsored by the parish’s thrift shop. Tickets, luncheon receipts, and clothing sales raise funds for the projects the Thrift Shop supports within and beyond the parish. A second, equally-important goal is the Christ-centered fellowship that comes with working together to plan and conduct a community event. This is definitely one of the most fun-filled events in the annual calendar at St. Paul’s! The Fashion Show involves parishioners from every walk of life, as well as their friends and families. The very picture of style. Photo, Michelle Lawrence. 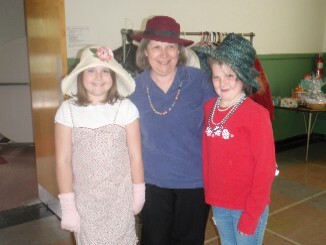 Good-natured parishioners succumb to the invitation to model the high-quality fashions held in reserve for the day. Even Father Greg takes a few turns! 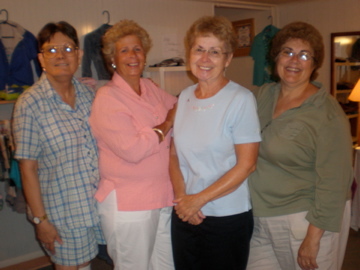 St. Paul’s Thrift Shop is open on Thursdays from 10:00 a.m. until 7:00 p.m., and is staffed by friendly, welcoming church volunteers. The Thrift Shop accepts men’s, ladies’, and childrens’ clothing and footwear in good condition and offers it for sale at affordable prices. The Thrift Shop also works with local service organizations to provide businesswear to people returning to work, and has a long history of generous assistance to families who have suffered a flood, house fire, or other disaster. Having a good time! Photo, Michelle Lawrence. For more information, please contact the parish office at 724-4771.